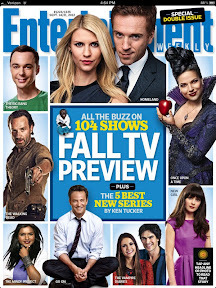 There is nothing a TVophile loves more than the start of the fall season, and I am there, baby! I am that dork who puts show premieres on my calendar so I don’t miss anything by allowing my ADD to let me forget when a show is set to start. For shows that are already in our DVR playlist and which don’t have any dramatic shifts in time slot, we are good to go, but the new shows are sometimes tricky to keep track of. There is so much awesomeness on that cover, I didn’t know where to begin. Actually, that’s a lie. I began with Once Upon a Time, which is easily my favorite television drama right now. Thank you, ABC, for the mini-marathon last weekend! Once was very closely followed by The Big Bang Theory (my favorite comedy), then The New Girl (my favorite theme song), the The Mindy Project (one of my most anticipated new shows). What will the Pop Culture Household (or at least two of us) be watching this year? Saturday Night Live (Sept. 15, NBC) — the first host will be Seth MacFarlane with musical guest Frank Ocean. Yes, please. *indicates I have already watched the pilot on U-verse OnDemand—thank you Big Four networks for making that happen (well, some of you, anyway)! Elementary (Sept. 27, CBS) — Sherlock Holmes and Lucy Lu? Yes! So, yes, if it is not totally obvious, I watch a lot of television. A lot. This doesn’t even count the shows I love on alternative cable networks, like Psych on USA, which has its own weird season. Now, I just need to go clear the DVR of old Bubble Guppies, Peppa Pig, and Sesame Street episodes [Season 43 premieres Sept. 24, BTW], so we have room for all the grown-up shows!